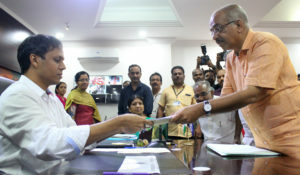 Two familiar faces.Who will take lead over the other?Kozhikode voters are still uncertain on their selection. Both are their favourite candidates beyond political affiliations. M.K.Ragahavan, Congress sitting MP is seeking mandate against A. Pradeep Kumar (CPIM),Kozhikode North M.L.A. This News was posted on Monday, April 1st, 2019 at 7:01 am and is filed under City Talk.